Picture taken on August 3th, 2011. 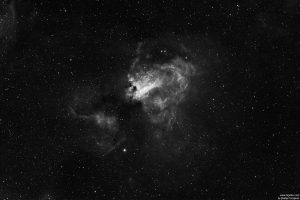 The Omega Nebula, also known as the Swan Nebula, Checkmark Nebula, Lobster Nebula, and the Horseshoe Nebula (catalogued as Messier 17 or M17 and as NGC 6618) is an H II region in the constellation Sagittarius. It was discovered by Philippe Loys de Ch�seaux in 1745. Charles Messier catalogued it in 1764. It is located in the rich starfields of the Sagittarius area of the Milky Way.